In a world full of guys that can shoot lightning and punch through brick walls, it's nice to see a guy like Hawkeye keeping it down to Earth. He can't lift a car with his bare hands, he can't zap the bad guys with lasers, and he certainly can't fly. Hawkeye just has to rely on his trusty bow and arrow, as well as his wits. If a guy like that can fight along side of mutants, super soldiers, and gods, then we think you're kiddo could too! All he needs is an amazing and heroic outfit, and he'll be ready to step into the role of a mighty Avenger! 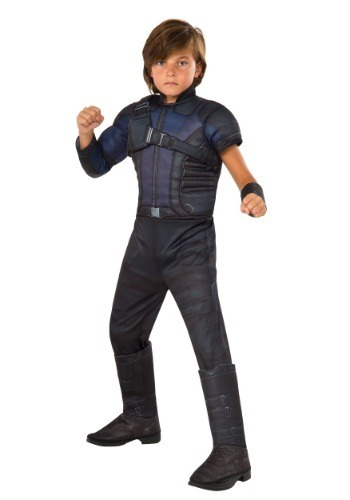 Based on his appearance from the Captain America: Civil War, this kid's Hawkeye Deluxe Costume will prepare your youngster to rumble with any of our planet's enemies. The costume has sculpted armor pieces designed into the front. It even comes with the signature gauntlet worn by Hawkeye during the confrontation with Iron Man and his crew. Just teach your kiddo some expert marksman skills and he'll be ready to go toe to toe with the Black Panther, Vision, or even the amazing Spiderman! If you want to ensure victory for your soon-to-be hero then you need to take a look at the rest of the Hawkeye accessories. Once your kiddo has an officially licensed Hawkeye bow and arrow set and a pair of combat boots, he'll be ready to enter the fight for the fate of the world. Until the battle starts, your child can enjoy a Halloween full of protecting the neighborhood from being overrun with tasty treats!